She-N-He Photography - 12.4.09 Alanna + Nate Engaged! 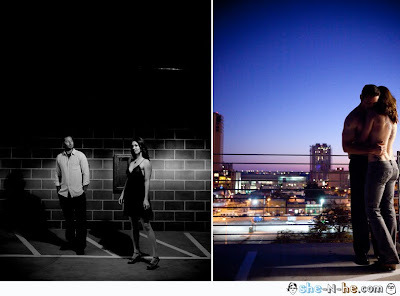 Alanna + Nate won an engagement session from us at the Weddings Unveiled event in October. We actually met them a couples times before they won the package, so we were so excited to get to work with them. Alanna went to school for Photography and her taste is very specific, she wasn't finding the right photographer out there. I think we've won her over. "Melanie we LOVE THEM!! Thank you so much, these are everything we hoped they would be :)" and "Those pics are AWESOME. You made us look great, we are a little in love with ourselves now. :) We keep looking at them, it's cute Nathan probably looks at them more than I do." So we are very happy and proud to have taken part in their new life together. Hope to see you in October, guys.